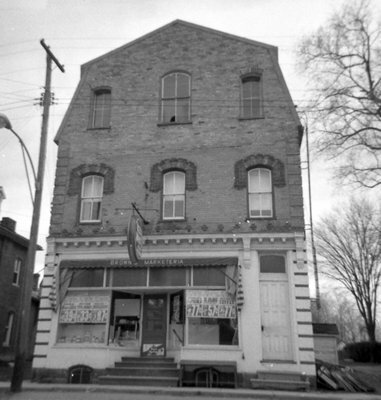 A black and white photograph of 58 Baldwin Street. The building at 58 Baldwin Street (on the west side of Baldwin Street north of the Brooklin Hotel) was built c.1878 for Mr. R. Balfour. From c.1878 to 1912 it was the location for T.J. Holliday's store. Throughout the years the building has been many different types of stores. In this picture it is the location for Brown's Marketeria. 58 Baldwin Street, April 11, 1966, Brian Winter. Whitby Archives A2013_004_277.